The item is the Hard Rock Cafe Albuquerque GO STAFF'10 pin. 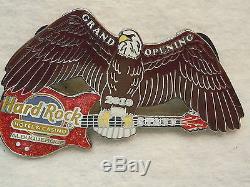 The pin is a horizontal red guitar with an eagle with spread wings. Thanks for looking and please make sure to check out my other listings and add me to you Favorites List! The item "Hard Rock Cafe Albuquerque GO STAFF Guitar'10 Pin" is in sale since Thursday, September 08, 2016.